Yuletide is approaching us fast, and soon it will be time for us to decorate our houses, both interiors as well as exteriors with the best of cheerful looking decorative accessories. A house cannot be called ‘Christmas prepared’ unless you deck its living quarters as well as outdoors with festive decorations. When speaking of outdoor, gardens, porches, front and back yards come to mind, and these are the very spots that are instrumental in spreading the first cheer of Xmas. 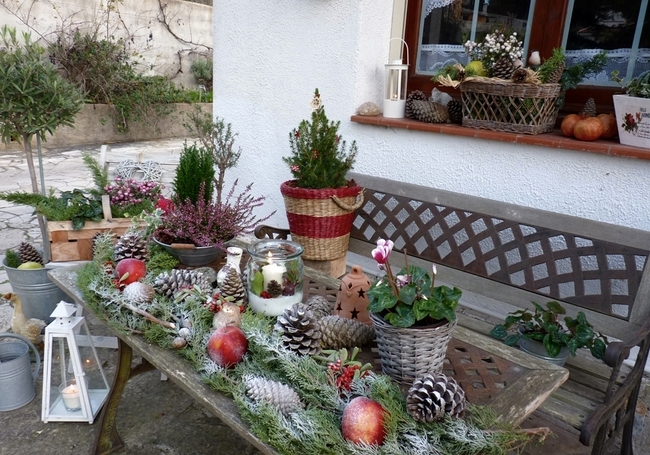 For a ‘Christmasy’ garden or lawn, you no longer have to depend on store bought things. Now, with the help of these awesome DIY Christmas lawn decorations that are about to be showcased below, you can all achieve that magical, cheerful, and above all a cheap yet classy Xmas lawn and yard. All these are creative decorations meant for amateurs as well as pros. 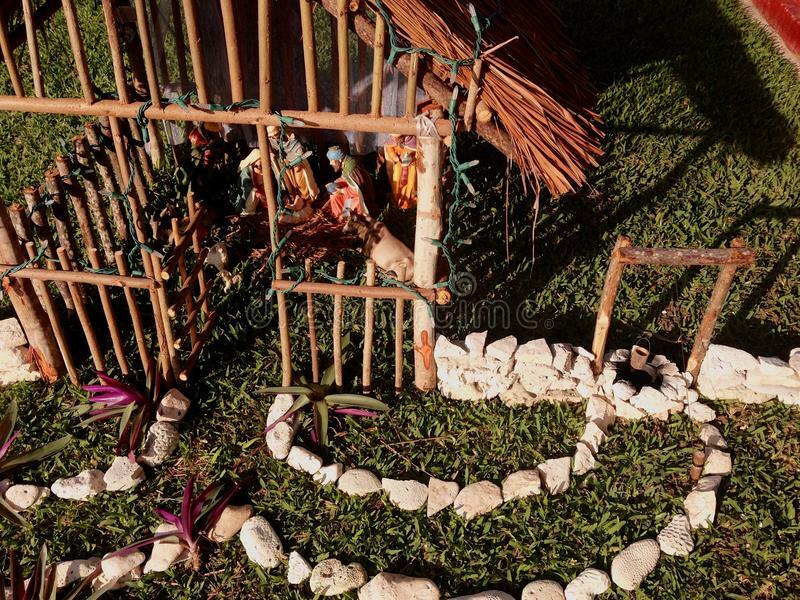 With these decor ideas, you can transform your lawn into a beautiful fairy garden, or a white winter wonderland, or, create a Nativity Scene at no cost at all. From scrap wood, old PVC pipes, concrete, string lights, to old tires, we have every possible idea covered today. Let’s get on with this post and check it out for more info! Christmas yard decoration ideas with pallets are probably done to death by most Christmas decorators. But, the fact remains that wooden pallets remain an all time favorite accessory for crafting innovative and adorable Xmas decorations as these are cheap and easily affordable by all. 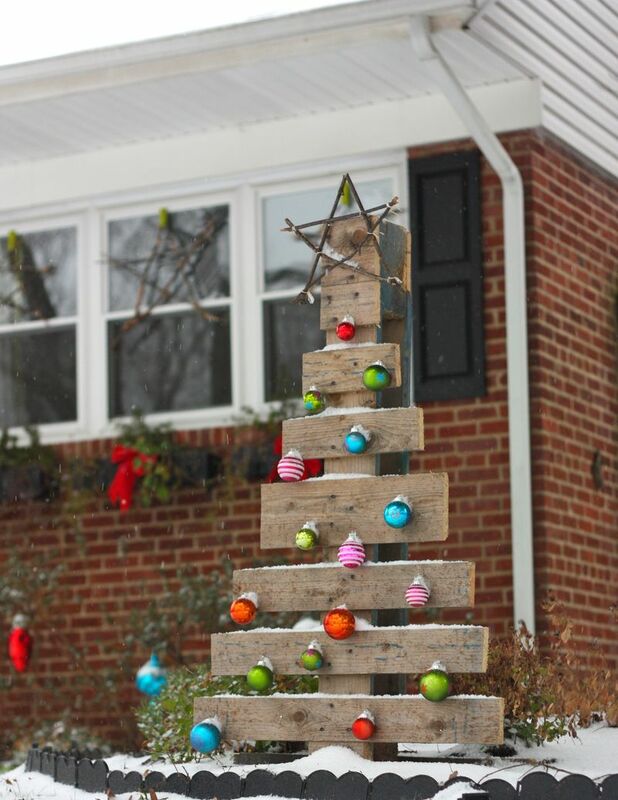 You can create any Christmas accessory using pallets like an Xmas tree, such as the one in the image. The tree is made out of pallets and is rustic in appearance. You can collect a few pallets, saw, some Christmas balls and baubles, and then put together a cute looking tree right outside your front yard or in your lawn. These lit gift boxes are just right for your Christmas this year as these look awesome and will surely brighten up your festive mood! This is an easy DIY project in which you can use your old PVC pipes to frame your gift boxes, and then wrap the outer frames with some neon paper or any fabric you like. The borders can be decorated with string lights for evening use. You can place these under your DIY Xmas tree and wrap these with satin ribbons or any accessory that you love. A great project that will save you loads of money! Now is the chance to build outdoor Christmas decorations using homemade and cheap accessories like your chicken wires. A chicken wire can aid creatively in crafting stunning Xmas trees that look innovative and a bit out of the box. All you need to do is get some wires, and then using a tool, shape them up into any mould like a tree or a ball for decking up your yard or lawn. You can also wrap your wire shapes with fabric or wrap with string lights. Christmas lawn decorations must look festive, and what better way to bring in cheer and good spirits than using Christmas balls and ornaments? 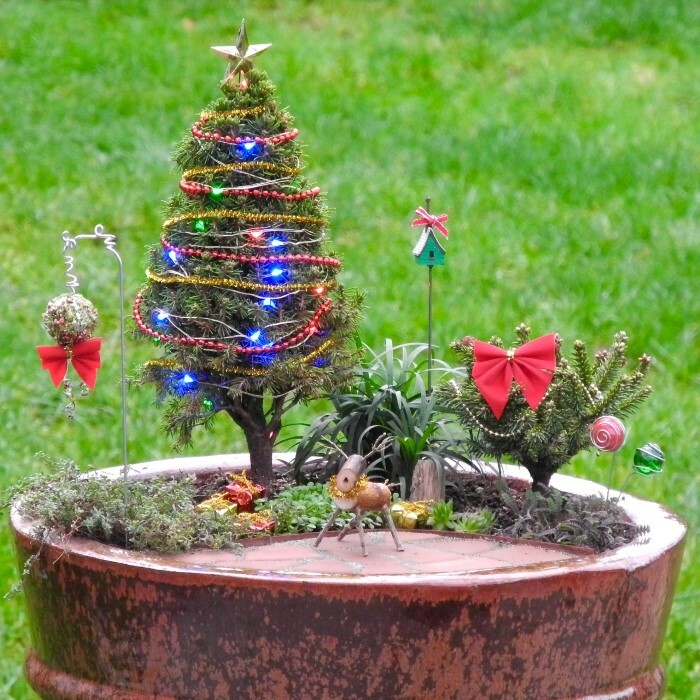 Well, you can team these ornaments with pots in your garden to spread a festive vibe. Choose any potted plants or vacant pots, and then fill these up with silver, red, gold or any colored balls along with ribbons and other decorative pieces. Doing the above project is very easy and your kids too can help you out in decking these up! One can deck up lawns with creative DIY Christmas yard decoration patterns like those with wood, or ornaments. In the above picture, the decorators have utilized beautiful looking stakes in blue, purple and gold with tops decked up with balls. These stakes lend a cheerful look to the yard or lawn, and are perfect for decorating using DIY ideas. You can make these stakes either out of wire, plastic, or metal. For any Christmas decor, you will need loads of ornaments in various hues like red, silver, golden and green because these are perfect accessories to bring in the feel of Yuletide. 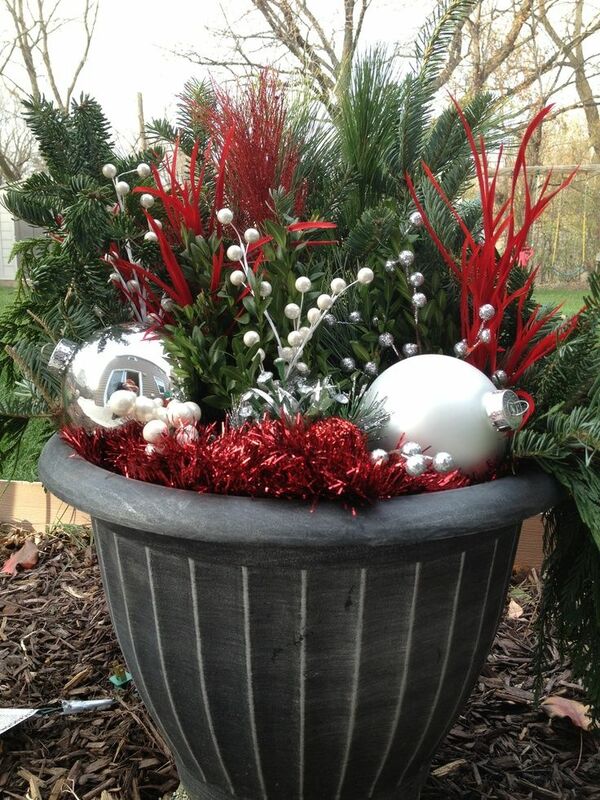 The best part about using balls in red and silver is that these match well with any landscape or interior. The decorator above has used these balls to deck up the plants in the lawn in a very creative manner. The sharp corners of the succulent above have been decked with red and silver shining balls. You can achieve a creative pattern with the help of this idea. This is a very creative and festive idea for decorating your lawn as it not only helps in adorning your outdoors with Christmas cheer, but also offers a creative edging for your plants. Use plastic or thermocol for this project. While, the candies can be made using these two materials, the sticks can be made using wood or metal pipes. 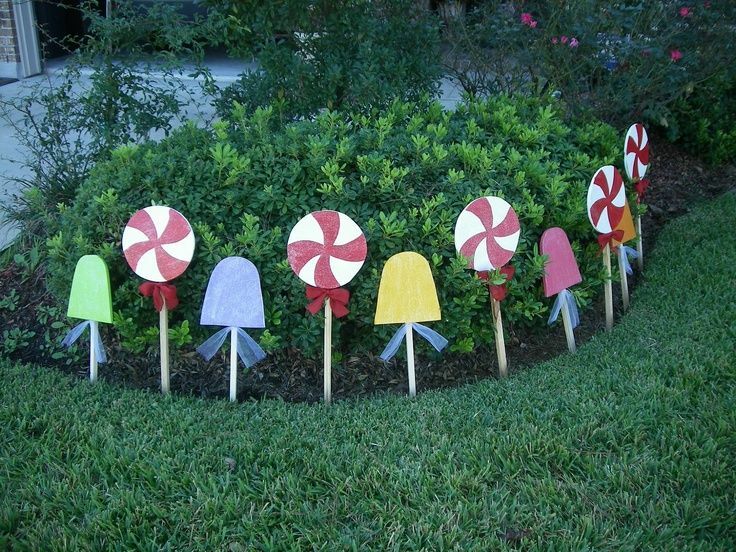 Color these up using any paint so as to replicate candy and popsicle. Arrange these around your plants. This is a very simple and child friendly project for this year’s holidays! Christmas seems incomplete without string lights and a tree. Now, you can give your lawn or yard a Christmas makeover by investing in some chicken wire, string lights and LED mini lights. Use a wire cutter for crafting this idea. 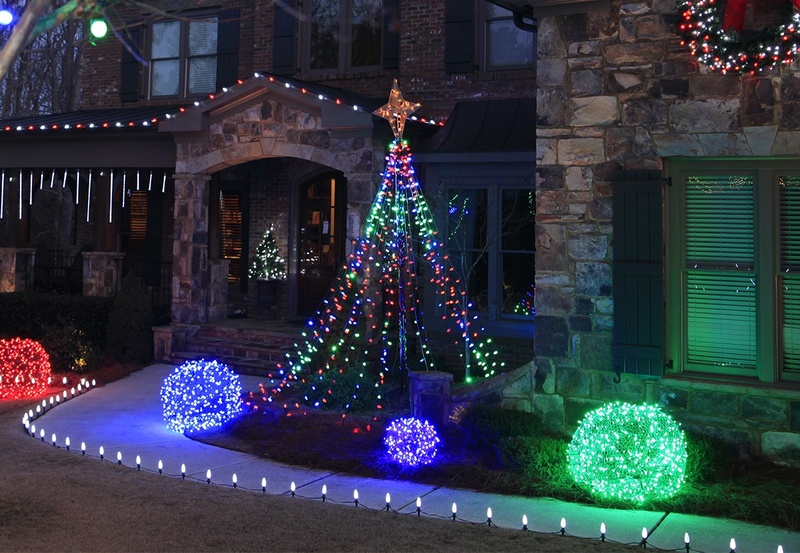 First, place a center pole, and then hang string lights in various hues so as to form the shape of a tree. Now, top the tree up with a star. Then, create balls using wire, and wrap these up too with string and LED mini lights. The balls and the tree will become the center of focus of your house and will make everyone’s jaws drop! Cheap DIY outdoor Christmas decorations like the one shown in the image will not put a big dent on your pocket plus these will add an instant festive spark to your outdoors like front yard or lawn. 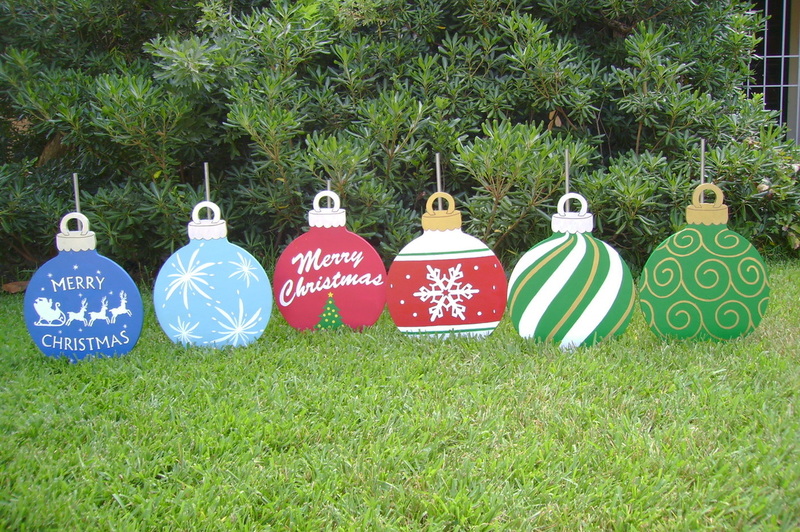 The plywood ornaments in Xmas tones look very cute and can be placed anywhere in your lawn or garden. You can create any kind of shape with plywood using commonly available accessories like paint, glitter, plywood cutter, apart from plywood. Train patterns in Christmas hues can enhance your outdoor appeal in an instant, just like the cute Christmas train made out of cardboard. This project may look difficult, but its pretty easy. All you need to buy is cardboard, some paint, and other decorative accessories, and then, craft out a train pattern made out of Christmas figurines of Santa, Gingerbread man, cookies, trees, elves and fairies. Any Christmas holiday that doesn’t have gingerbread as one of its decor feature will feel bland and boring. Gingerbread man or a train is most loved by families with kids as it looks adorable. You can take the gingerbread feature to another level by crafting a reindeer stable made out of it. It is a simple, easy breezy project involving simple things like cardboard, glue, and paint. Do try making it this time! Here is one of the most innovative and cheap DIY outdoor Christmas decorations you can put up in your lawn this Christmas. This DIY idea makes use of old wooden fencing and scrap wood that is used to craft out gift box shapes as shown. You can pick a part of your old wooden fencing and then place it randomly around in your yard or lawn. Then, team it up with wooden or foam gift box shapes in various colors for an added Xmas punch. You can take the help of your children in building this decorative feature. DIY Christmas is more satisfying than the one that is not. All of you that are avid DIYers can now craft out any kind of festive accessory using this above idea. The theme of this DIY idea is Grinch and you have to use cardboard for it. You can make the forms of the Grinch, and the people using chart paper. Then, using these, you can get the shapes on cardboard. After you have gotten all your figurines in cardboard, you can paint these up using any color like green, pink, red and white. Christmas trees in wood always spread a warm feel to any Yuletide celebration. That is why plywood and pallets are so popular the world over. For building these trees, you would need plywood, a whole set of nails, edge softener, driller and saw. Firstly, you have to shape the trees on the plywood. Soften the edges and then apply wood polish. After the polish has dried up, deck the corner portions of the trees with nails. You have to use nail drillers for this. The project is rustic and is fit for country homes. If DIY is running in your mind these days, then choose such Christmas lawn decorations that are pocket friendly plus allow you to experiment with old and recycled stuff. In the above image, the decorator has made use of old wooden tables made of pallets to be transformed into a cute snowman. The features of the pallet snowman can be added using a whole lot of accessories as you like. The color chosen has to be white to bring in a ‘snowy’ feel to your holidays. Santa Clause and his sleigh are the two most prominent features everyone loves putting up when decorating their holiday home. You can try using plywood to build an entire sleigh together with a Santa. The project above looks eye grabbing and the decorator has made use of plywood for building the sleigh as well as the Santa. While, the sleigh is in pure white, the Santa is painted in red. This feature adds an instant festive glow to the house exterior, and you all must try it this Christmas. The lawn ornaments like the ones showcased above can light up any lawn or yard. You can make your balls using chicken wire, lights, gloves, measuring tape and wire cutter. After you have shaped the balls, its time for wiring the lights as per your choice. Place these light balls anywhere in your lawn for a sparkly Christmas festival! The above image is that of an awesomely crafted DIY decoration that everyone will love to create! This project is one of the most innovative among the rest of Christmas yard decoration ideas that have been showcased till now. 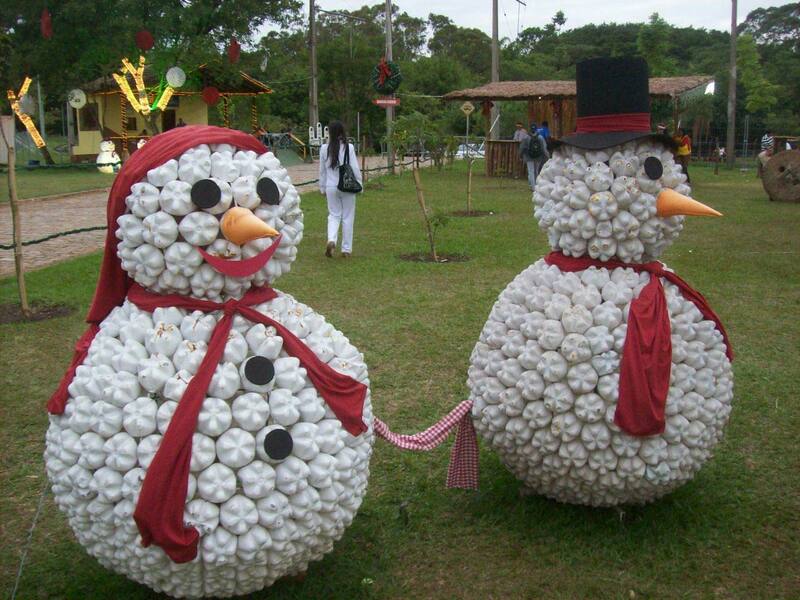 It makes use of old and used coke bottles that are transformed into two giant snowmen. You will need a large number of coke bottles and arrange them into snowman shapes like shown. Other things required are ribbons, ice cream cones for making the noses, pink chart paper for making the lips, black chart paper to make the eyes and lot of nails. This is a time consuming project, but is worth your effort and every money spent! These snowman cutouts in plywood look amazingly cute and are just meant for bringing in lots of cheerfulness to a holiday home. You can make cutouts using plywood, or cardboard. Then, use white paint to color these. Attach boards and markers with humorous or festive messages, just like in the image. This is quite simple to be crafted and it is budget friendly too. If you thought old things couldn’t be put to use effectively, then have a look above! Its a simple, yet, cute DIY project that has made use of old tires to craft snowmen, and some other things to help in making the facial features. Its done by painting nine tires in white, then, arranging these tires on top of one another. After you have given the form to these snowmen, its time to create their facial features. For this you can use paint, beads, balls or anything that you please. Place ribbons or hats over the heads if you like. Tables form an essential feature at any Christmas setting. Be it inside your home, or outside in the lawn, tables can be used to enhance the look, just like in the image where the lawn table acts as a decorative piece by itself. It has been decked up rustically using pine cones, candles, apples and birch, decked up with a touch of frost. The whole table setting looks ‘Christmasy’ and very cheerful. You can either craft these yourself, or can also buy these from shops selling Christmas accessories. Most shops offer great discounts during the holidays. You can buy these and then arrange outside in your lawn or yard yourself. The ‘JOY’ fixture above lends a festive look to the lawn and is definitely worth a try this Xmas. In this project, the decorator has done full justice to using old scraps of wood. It is a rustic themed Christmas tree project that is accomplished using wooden planks. After the tree is crafted, the decorator has wrapped Christmas string lights all over. The gift boxes seen at the base of the tree are made using cardboard boxes and are helpful in creating a festive vibe. The arbor placed on the pathway too looks very beautiful and is decked up using lights and greens. A must to try this year! 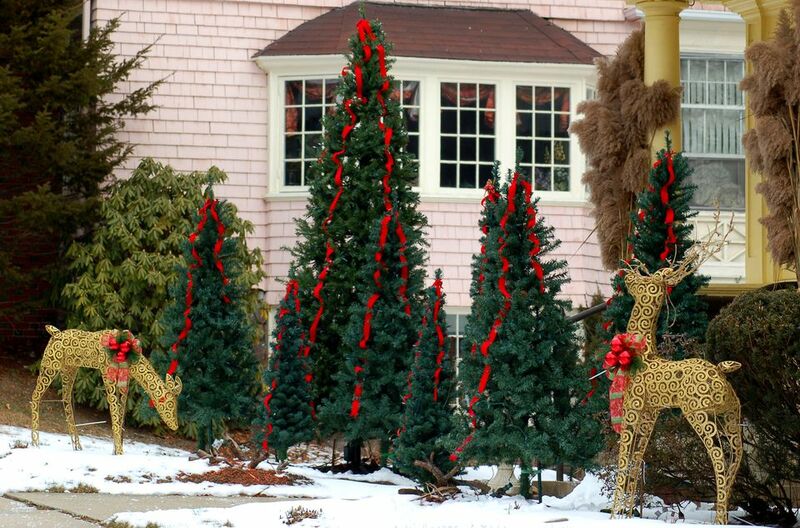 Christmas yard decoration patterns can range from wooden themed accessories to balloons and inflatables. In the picture, the Snoopy dog inflatable looks cuter than cute on a snow clad lawn with hints of greens here and there. Buy this inflatable from any store and then decorate it using your imagination. Use your own knitted cap if you want to accessorize it further. Placing the inflatable is easy. Lighting plays a dominant role in Christmas decoration everywhere. You can choose between a simple light display in your Christmas lawn or can also go in for a more electorate one, just like in the image. The lawn and the whole house above look stunning with glimpses of candy-cane, Christmas figurines, reindeer stable, gift boxes and a string of lights illuminating every inch and corner of the house and its outdoors. If you are looking for creative ideas this Christmas, then try this DIY idea as it is purely DIY and is a bit out of the ordinary. Create a fairy garden decor for your lawn and install a mini tee-pee made with wooden sticks or twigs. Around it, place some figurines like Santa, elves, dogs and other characters associated with Yuletide. Create your own mini garden right in your planter using this cool and cute idea that encourages you to make use of natural elements like greens and wood. For this project, you can use dwarf Spruce Christmas tree, some mini shrubs, mini succulents, ferns, Red Thyme, and miniature daisy flowers. Pair these up with miniature accessories like bird houses and bows. Craft a reindeer figurine out of miniature wooden logs. This miniature garden decor lends an instant festive glow to your lawn. The lit up sleigh pulled together by three reindeers looks spectacular, specially fit for nighttime. After you have created the sleigh and the reindeers using chicken wire, wrap string lights to add a sparkly touch to your decor. Place these over the fencing and spruce up using other decor features like red bows, snow and greens. This is a cheery looking Christmas craft idea anyone can do at home all by themselves. You would need wooden crates, lids of tins, Christmas decorations, glue, paint in various hues, chain, saw, drill, and lastly, screws. First, paint your crates in the colors seen above, then, the lids. Screw the lids to every crate to make the wheels, just like in the image, craft out the engine by stacking two crates on top of each other. Glue a tin on top to resemble a smoke stack. Thereafter, use chain to attach all the crates to form a festive Christmas train. 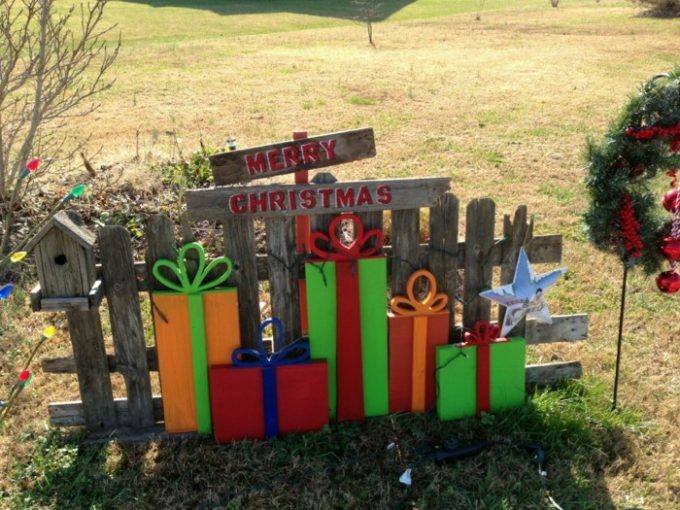 DIY Christmas lawn decorations need not be crafted at home. There are many DIY stores selling affordable and creative DIY stuff for festivals like Xmas. The lawn above looks spectacular and is ready for Xmas celebrations. It is decked up with faux Christmas trees decked up with red ribbons and golden DIY reindeer figurines bought at discounted rates. The whole setting in the lawn is festive and very cheerful. Christmas Nativity Scene is always loved by Xmas loving people as it helps in experimenting with loads of ideas. The above project is fun to do and motivates all to go natural. It makes use of wood to craft out the stable, rocks and stones to create pathway and some figurines that can be bought from stores. The nativity scene here inspires merrymakers to spread the warmth of love all around. 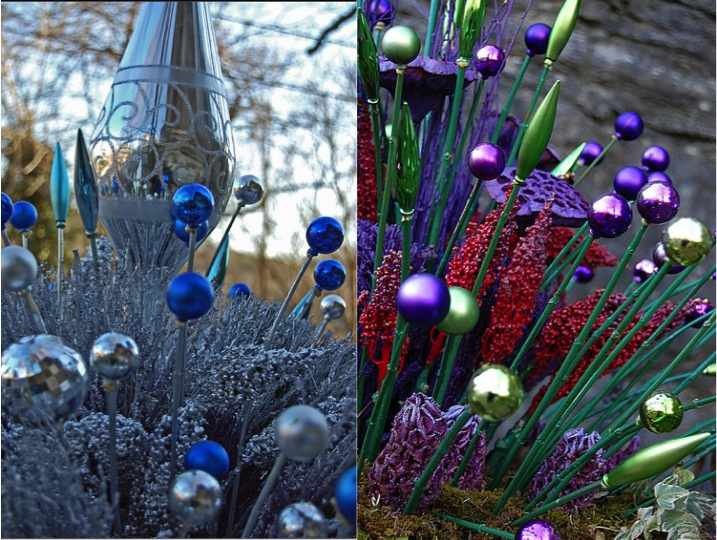 For a stunning and magical Christmas holiday, you need to try out these amazing DIY Christmas lawn decorations. These do not need you to spend a fortune, or, require too much of your precious time. These are easy and quite comfortable to be crafted by people of all age groups. So, get ready to wow all with these gorgeous lawn decorations we have just shown!